Wings Hawaii is bringing whimsical and stylish beach-inspired jewelry to fashionistas everywhere. Each exotic and hand-crafted piece of jewelry is inspired by our gorgeous surroundings in Maui, HI and the semi-precious stones and shells are collected straight from the beaches of Hawaii. 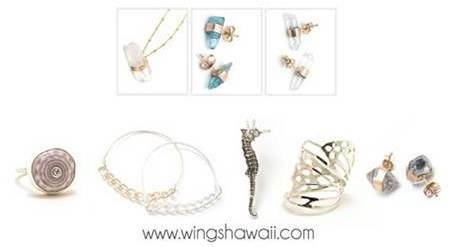 Whether enjoying a day in the sun or a night out on the town, Wings Hawaii's delicate jewelry completes any outfit. View a line sheet with a selection of some of their featured jewelry items. To view their full clothing and jewelry lines, visit www.wingshawaii.com.